Two years ago Carol Colton, 42, of Le Roy, was invited to go kayaking in Black Creek with friends. She had never been kayaking and didn’t have her own kayak, but it was no matter her friends told her, they had one she could borrow. “It took me about 10 minutes to fall in love with it and decide I would get my own kayak,” Colton, said. Now, she has five kayaks. Kayaking has become an important part of Colton’s life and a way she spends quality time with her husband Brian and four children Natalie, 8, Sara, 10, Emily,11, and Sam, 13. All over the Rochester region individuals and families like the Coltons are discovering the benefits of kayaking and taking advantage of the plethora of waterways that run through the area. “We’ve seen a huge growth in kayaking over the past few years,” said Peter Abele, president of the Erie Canal Boat Company Inc., located in the village of Fairport. In 2006, Abele’s company — which rents recreational kayak and canoes designed for those with little or no paddling experience — put 1,500 paddlers in the Erie Canal. In 2012, that number swelled to 4,000. “It’s becoming more popular with families because it’s something all ages can do together,” said Abele, who last year saw kayakers ranging from ages 8 to late 80s in his boats. Abele also believes that handicapped accessibility has played a part in the growth of kayaking. He has a Hoyer Lift on his docks that allows him to place wheel chair bound individuals into a kayak. BayCreek offers sales, rentals, classes, overnight kayak camping excursions, and a kayak summer camp for kids ages 7 to 13. When Vandebroek aged-out of the camp, she was still too young to be an instructor, so she volunteered to wash boats at BayCreek just to be around the kayaking scene. She later became a counselor and then an instructor of a kayaking class at Cornell University, where she attended college. Currently, she is a coastal engineer and sea kayaks in the San Francisco Bay and Santa Barbara area. Learning how to paddle is a key component of one of Rochester’s most important resources for kayaking: the Genesee Waterways Center (GWC). Founded in 1996, the GWC is an independent, not-for-profit organization, promoting affordable human-powered paddling, rowing, and related outdoor activities in the Genesee region. Instructors at the GWC have taught students from around the world and with varying degrees of experience at their two facilities in Rochester: the GWC Boathouse on the Genesee River at Genesee Valley Park on Elmwood Ave. and The Lock 32 Whitewater Park, which opened in 2000. Lock 32, which opened in 2000, provides a controlled environment in which students can learn and a challenging area for experienced paddlers to practice. The course features a set of squirt lines, two wave and two holes and a constant source of water every day. At the Genesee River facility, flat water kayak rentals and classes are offered for all individuals and groups of all levels. “You can paddle 26 miles to the Mount Morris Dam or north one and a half miles for a spectacular view of the city skyline,” Stachowski said. Stachowski took over the helm of the GWC in 2009 and has seen tremendous growth. A Groupon promotion last May offering a ½ day of canoe or kayak rental at the GWC for $15 sold a staggering 3,000 coupons. “When I first started working here it was a hidden treasure and I said ‘We don’t want to be a hidden treasure,’ ” Stachowski said. According to an article by Irene Szabo in the Finger Lakes Trail News, the days of the iconic railroad bridge over the Genesee River in Letchworth State Park are numbered. The current steel and iron trestle was built in 1875 to replace an all wooden structure that serviced the original Erie Railroad since the 1850’s. Now Norfolk Southern needs an updated bridge that doesn’t require frequent repairs, a 10 mph speed limit, and lightly loaded rail cars. 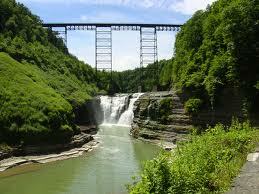 The plans call for a steel single arch trestle to be built 75 feet further south. They hope to being a 3-year construction project this summer. Plan now to attend the FLTC Spring weekend on June 1st. It may be your last chance to walk beneath the 138 year old portage bridge. 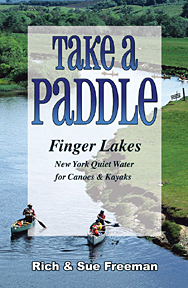 It explore it on your own this spring pick up a copy of the guidebook “Take Your Bike – Family Rides in the Finger Lakes and Genesee Valley Region” and refer to page 65 for the Genesee Valley Greenway -Portageville to Nunda chapter. Just do it soon. Once construction begins, the trail will be temporarily closed. 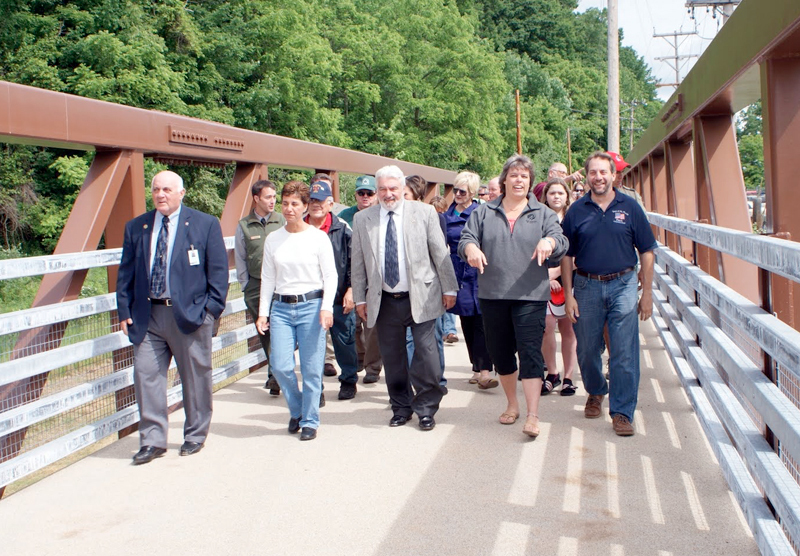 A ribbon cutting Monday morning officially opened a new “Rails to Trails” bridge over the Genesee River, connecting the University of Rochester and the Plymouth-Exchange neighborhood. The $1.8 million Erie Lackawanna bridge sits atop a bridge deck originally constructed in the 1850s and enlarged nearly 100 years ago. During the ribbon-cutting ceremony, the city also was presented the 2012 Champion Award from the New York state Bicycle Coalition. This is the third railroad-to-trail conversion opened this year, with the others being at the Public Market at the El Camino trail in the northeast. Re-purposing of these old structures and rights of way can “make the new city,” Mayor Thomas Richards said, before taking a ceremonial “first walk” across the bridge with UR President Joel Seligman. “Mayor, I’m with you for a walk and maybe, some day, a bike ride as well,” Seligman said to Richards. 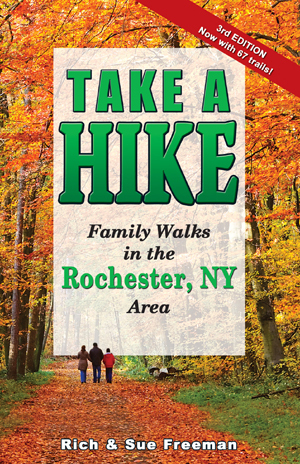 To enjoy the many rail-trails of Rochester, pick up a copy of the guidebook Take Your Bike – Family Rides in the Rochester NY Area.